REVERSE OSMOSIS MEMBRANE The R.O. Membrane is the heart of the filtration system. It is designed to reduce the dissolved mineral content of the water. 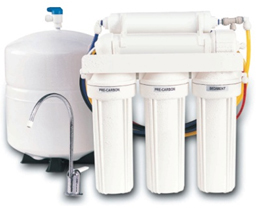 In the Reverse Osmosis process, dissolved minerals are separated from the incoming water (Feed Water) to produce the filtered water (the Permeate). The excess minerals are rinsed to drain (the Reject Water). The membrane is a specially constructed, fully aromatic polyamide film, and is classified as a Thin Film Composite (T.F.C.). The spiral wound construction of the R.O. Membrane provides maximum surface area for water production and filtering. MECHANICAL FILTRATION The Sediment Pre-filter has been designed to reduce the larger particles such as silt, rust and scale. Not only does it deliver the highest quality water, but also maximizes the life of the R.O. Membrane reducing your overall cost of ownership. ACTIVATED CARBON The Activated Carbon Pre-filter contains carbon particles which absorbs substances that contribute to tastes and odors. The activated carbon in the Pre-filter has been designed to reduce any chlorine that may be present in the water entering the system. INLINE ACTIVATED CARBON POST FILTER The InLine Activated Carbon Post Filter is located after the Holding Tank and has been designed to reduce the tastes and odors that may pass through the system. It adds a final polish to the water. AUTOMATIC SHUTOFF VALVE The ASO Valve senses when the Holding Tank is full and closes the feed water supply to prevent excess reject water from going to drain when the unit is not producing water. For more information please call a Christianson water quality expert today. You can also learn more about the Nugen WaterMaker 5 here.